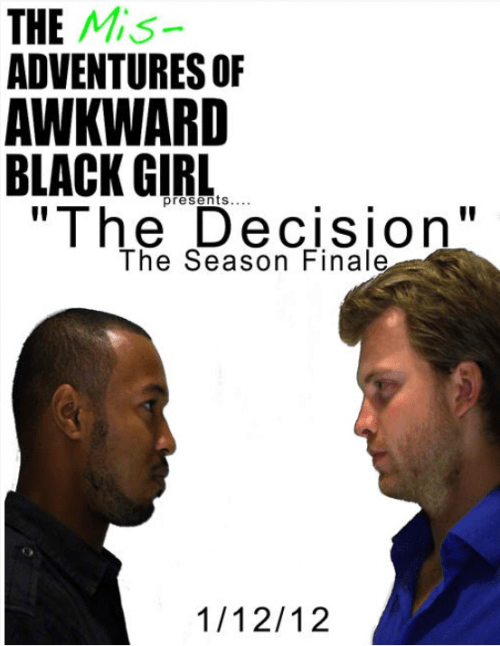 We are now 3 days away from Season 2 of Awkward Black Girl and I am counting down my best ABG episodes. Today we are on #3 which I picked because everything I could ever want out of a season finale was in the episode. The episode is of course episode 12, The Decision which was the season finale of Season 1. The episode was great because not only did **Spoiler Alert** J pick white J but there were so many awkward moments that had me cracking up so hard. It also had a nice set up of where season 2 would pick up. Oh and cherry on to is the cameo by one of my fave new rappers, Childish Gambino. You might know him better by his government name, Donald Glover or simply as Troy from Community. Tomorrow we shall get into my 2nd best ABG episode. If you missed what my #5 and #4 episode were check them out here and here. After an almost riot by ABG fans on Facebook and Twitter for the one day delay on the episode, Issa Rae premiered the season finale today. The episode is the longest one yet, clocking at 25 minutes and is definitely worth the wait. Check it out. Spoilers ahead.